Dark Moon Digest is a quarterly horror fiction magazine produced by Perpetual Motion Machine Publishing and is available to buy via Amazon or via Perpetual Motion Machine Publishing. Inside are some really good stories, I think nine in all and not one of them was a dud. 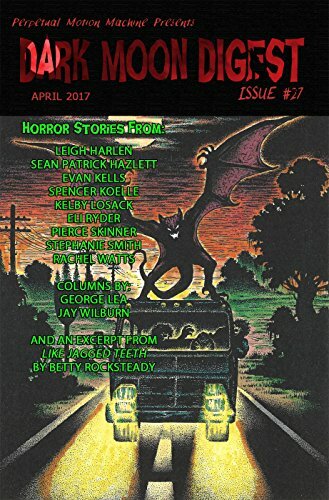 There's a really fun feel to this magazine just full of really great horror tales that will make you wince and jump in all the right places. For me, my personal favourites were; I Will Find Them All by Evan Kells, Lost by Rachel Watts and The Screaming by Leigh Harlen. Though I feel it's important to say I really enjoyed them all. There's a really diverse offering of tales featuring all sorts of creepy monsters, there's something in here for everyone. As well as stories there's also articles from Jay Wilburn and George Lea as well as the first two chapters of Betty Rocksteady's new novella Like Jagged Teeth. I bought this for my kindle and it came to under £3! I do love a bargain and will definitely buy it again in the future.